This week, sanitation is at the top of the agenda in Haiti. “Improving sanitation is everybody’s business. Each toilet built, adopted and used, means that one family won’t be affected by cholera and other waterborne diseases that cause the death of more children under five years than HIV / AIDS, malaria and measles combined. 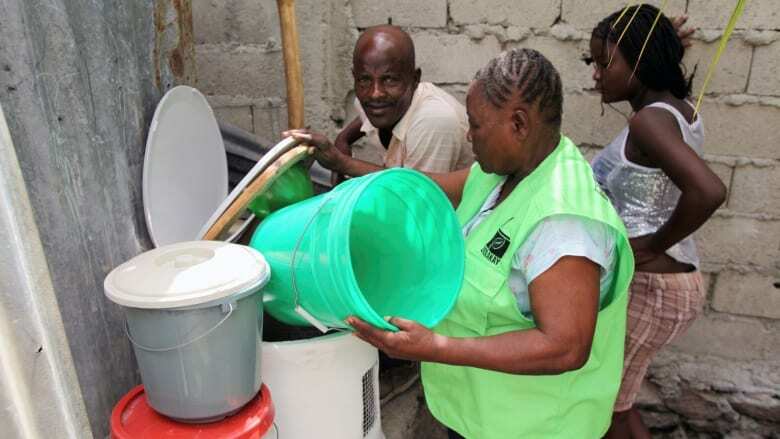 We cannot ignore the possibility of saving lives by improving access to sanitation and supporting this new national roadmap,” said Mary Barton-Dock, World Bank Special Envoy in Haiti. In the countryside, many people are used to defecate in the open. There is certainly a lack of access to adequate toilets as only 28 percent of the population have access to adequate toilets. But as in many countries, the heart of the problem is that much of the rural population does not usually use a toilet even when they have one. Sometimes toilets remain closed and are only used for guests. The stakes are particularly high in a country where waterborne diseases caused by poor hygiene and sanitation practices are responsible for 20 percent of deaths of under-five children. To address this problem, the National Direction of Water and Sanitation (DINEPA) launched, with the support of the World Bank Group, a roadmap to raise awareness and encourage households to build or improve their own latrines. As part of this strategy, DINEPA doesn’t grant any direct subsidies to households for buying a toilet. It does provide them with consulting services for the construction of latrines. One of the major challenges of many Haitian cities is the fight for adequate sanitation. Haiti is currently experiencing significant population growth, with a 57 percent urbanization rate in 2014 that should reach 76 percent in 2050. In this context, providing institutional sanitation facilities in public schools, health institutions and public spaces such as markets is essential. Sanitation efforts are difficult when small fruits and vegetables merchants who spend over eight hours a day in markets, do not have access to adequate latrines. The situation is equally dramatic in schools where most institutions have sanitation infrastructure which are generally poorly maintained and used. “To improve this situation, the strategy stresses education and promotion to raise awareness and encourage households to build or improve their own latrines, and the need to install toilets in schools, hospitals and other public institutions,” said Edwige Petit, Director of Sanitation at DINEPA. There is virtually no viable systems for collection and treatment of waste water in the country. The bayakous or septic tank cleaners, go down into the septic tanks without protection. They are not counted, not equipped and have only wheelbarrows to dispose sludge. In this case, it is impossible that such waste can be transported to treatment centers. One of the objectives of the strategy will be to formally incorporate the bayakous into sanitation sectors. The vast majority of contaminated water is poured unchecked into the natural environment with serious consequences for health and environmental degradation. There is currently only one treatment site whose operation is difficult. With five other centers under construction, there is nonetheless some hope for improvement. International organizations fund an average 60 percent of the National Direction for Water and Sanitation’s operating costs. This week, the sectoral dialogue focuses on the return on investment. In Latin America and the Caribbean, the calculations show that US$ 1 invested in sanitation produces US$ 7.20 in return, including direct savings in health care and productivity gains in days. To contribute to a solution and to strengthen institutional capacity, the World Bank Group is working with partners in the sector to provide the country with long-term and sustainable financing. No Replies to "The World Bank: Building Toilets And Changing Behaviors Can Save Lives in Haiti"